I’d planned a South Indian extravaganza on Sunday night. It’s probably my favourite cuisine and certainly one of the most naturally vegan. We visited Kerala in south India a few years ago and are going back to Kerala and visiting Tamil Nadu in January – I can’t wait. Our favourite local restaurant is Tamil and we seek out south Indian food at any opportunity. So I’ve been dying to try some dishes from my new book, Dakshin’s Vegetarian South Indian for ages and had it all planned. Eagle eyed readers will have spotted that the meal featured in this post is Chinese and not Indian… I’d done the shopping for my menu but when I pulled out the book on Sunday I realised that 2 of the dishes I’d planned needed blending. If you’ve been paying attention you’ll know that my blender is broken. GRRRRRR! 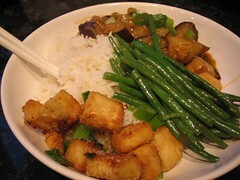 So I needed to take an aubergine and some green beans and do something with them. My thoughts turned to a Gary Rhodes recipe I’d seen, a tofu recipe I’d wanted to try for ages, and decided to make something up with the beans. Thus was born this Chinese spread and I LOVED it. I made a few changes to the Gary Rhodes recipe. I almost never peel aubergines and I didn’t here. I didn’t have the pickled chilli sauce so I used normal chilli sauce and a bit of extra vinegar. I’d bought some chingkiang vinegar and wanted to try it, so I did. I blanched the beans then very briefly stir fried them in sesame paste and soy sauce. Well, we both really enjoyed this meal and ended up quite glad that I’d had to improvise. The aubergines were meltingly delicious and the crispy salty tofu was beautiful But never fear, a blender is on its way and i’ll be back on the South Indian trail soon! This entry was posted in Uncategorized and tagged vegan; chinese by efcliz. Bookmark the permalink.